The Purple pillow uses Purple’s proprietary polymer base to make a sharp, rectangular pillow that’s unique and unlike anything else you’d find in a bedroom. But does unique result in a better night’s sleep? Today, we’ll be taking a closer look at the Purple pillow to uncover the truth. Why is Purple Pillow So Popular? The Purple pillow takes much of its popularity from the disruptive nature of the Purple mattress from the same company. And that product itself turned heads with a unique design that has to be felt to be believed. Many traditional mattresses use springs and soft cotton, while many bed-in-a-box companies use a memory foam material. However, Purple circumvents both and created a mattress that’s reliant on a grid-like, unique material. 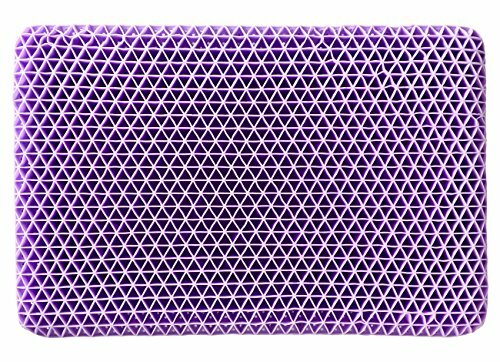 The company calls it Hyper Elastic Polymer, and the result is a Purple grid that lines the top of each of their mattresses. The material is said to allow for breathability and cradle pressure points without being too firm or too soft. Sleeping on Hyper Elastic Polymer results in a unique feeling that might not be right for everyone. However, for fans of a cooler pillow or the level of support found on the Purple mattress, the Purple pillow uses the same material to create a surface that supports the neck. What makes the Purple pillow so popular, especially for those who suffer from neck pain, comes from this proprietary polymer. The small Purple squares conform to your neck and hold it without pushing too hard or causing undue pressure to mount. Who’s Behind The Purple Pillow? The maker and creator behind the Purple pillow is not some massive conglomerate or seedy corporation—but rather, two brothers. Tony Pearce and his brother Terry, both engineers, created the polymer that would ultimately be patented and used in Purple pillows. Their Kickstarter page was launched in 2015, and through donations, they were able to start making their products full-time. Since then, Purple has become a giant in the bed-in-a-box marketplace. Their reputation for being an innovator and a game-changer comes from their ads just as much as it does from their creation. In just a few short years, these engineers were able to build a mattress (and a pillow) that would draw the acclaim of many, and ire from a few. 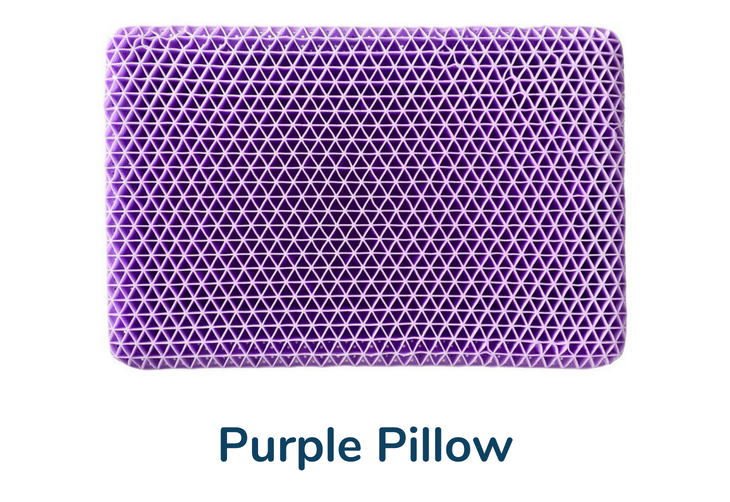 The biggest selling point for the cooling benefits of the Purple pillow is the polymer itself. Since the entire product is made from the grid system, much of the product is just empty air. This allows for support in the places you need it and airflow to move freely between the cubes. This makes Purple one of the coolest pillows on the market. Memory foam pillows tend to suffer from overheating, and can retain smells that are less than pleasant. Purple avoids this by coating their polymer in a bit of power to keep smells away. What Is The Purple Pillow Made of? The Purple Pillow is made completely from Purple’s unique Hyper Elastic Polymer. Like the name implies, this highly responsive material is what gives the Purple pillow it’s unique, sharp rectangular shape and purple color below the covering. As a product made from Purple’s polymer, the Purple pillow is not only washable, but completely waterproof. You’ll just need to remove the cover and load the polymer into a standard wash and dry cycle, and you should be good to go for the next night. Where to Buy Purple Pillow? Although Purple pillow was initially something you could only buy from the company itself, online retailers like Amazon now offer the product. However, the price remains a stringent and steep 100 dollars no matter where you purchase it from. How Much Does A Purple Pillow Weigh? The Purple pillow is infamously heavy. Coming in at around 10 and a half pounds, we have little doubt that the Purple pillow is going to be one of the heaviest pillows you’ve ever used. While the polymer provides support, it does so at the cost of weight. Is Purple Pillow Good Quality? The Purple pillow is engineered to last, and while the Purple company is still relatively young, there’s little to be heard in terms of complaints from years of customers. We think there’s little to fear when it comes to the quality of the Purple pillow. How To Clean A Purple Pillow? The Purple pillow is machine washable, so all you’ll need to do is loss the pillow and cover into a washing machine and wash as you would any other pillow. The polymer and open air design also allows the pillow itself to dry much faster than most. What Is Purple Pillow Air Booster? The Purple pillow air booster was initially sold with the Purple pillow to offset the common complaint of height. Despite its large and heavy design, the Purple pillow is quite low—which can pose some problems for side sleepers. For the first few years of manufacturing, Purple offered an air booster, which operated as a sort of air mattress for your pillow. You would fill the air booster with as much air as desired and enjoy the Purple pillow at the height that’s right for you. Unfortunately, Purple no longer sells their pillows with the air booster. These boosters can be found from third parties, but for reasons unknown, Purple has discontinued this feature. Those who want to elevate the Purple pillow above its standard height will need to do so manually with another pillow, or find a dealer that still offers the air booster. The Purple pillow is often compared to My Pillow due to both companies making efforts to create a unique sleeping experience. While most pillows today use shredded foam or memory foam, both Purple and My Pillow have unique designs. Purple has it’s Hyper Elastic Polymer, while My Pillow uses irregularly shaped filling to lock in your sleeping position and support your neck. Both pillows do an excellent job at providing neck support, but aren’t totally the same. For instance, the Purple pillow sleeps cooler with its grid system, but My Pillow is tall enough and customizable enough to adjust without the need for an air booster. My Pillow is also considerably cheaper than the Purple pillow. Generally, My Pillow will work best for side sleepers and those on a budget, while the Purple pillow is better for back sleepers, stomach sleepers, and fans of the unique experience of sleeping on the polymer. Who Will Love Purple Pillow? The Purple pillow, like we’ve mentioned before, is a unique, sharp rectangle that isn’t going to be for everyone. However, it does work best in certain situations. If you want the support of memory foam without the overheating, then Purple pillow offers your best solution. The pillow keeps cool at night and never shifts filling by morning. There’s no fluffing and no padding necessary with this product. Likewise, if you’re a fan of a low pillow or sleep on your back or stomach, this is the product for you. Stomach sleepers will appreciate the low profile while back sleepers will like their head and neck supported. Side sleepers may also benefit from the Purple pillow—but perhaps should consider using one alongside a body pillow to supplement for support. If you’re also big on support of the neck, legs, or other areas of the body, the Purple pillow pairs will with special pillows, like a knee pillow. That level of versatility is what makes Purple stand out, despite its high cost. Plus, with a 100-night warranty, you can be comfortable using the Purple pillow for months before locking in or seeking out a different material for your night’s rest. Is it The Best Neck Pillow? So, is the Purple pillow the best neck pillow on the market? If you’re a back sleeper, then we would have to say “yes”. The Hyper Elastic polymer creates a boundary of cool support that simply can’t be replicated by others. Likewise, more polymer material at the edge versus the center means your head will sink while your neck doesn’t. Stomach sleepers will also benefit, but for side sleepers, you may want to seek out the air booster or other methods of lifting this product to really get use out of it. Otherwise, a thicker pillow goes a long way for helping side sleepers keep their neck supported through the night.